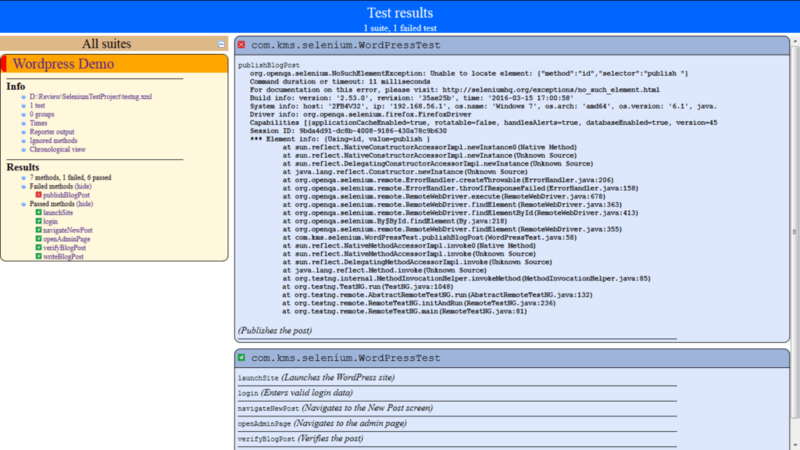 Katalon Studio is a test automation solution that leverages Selenium’s core engine. 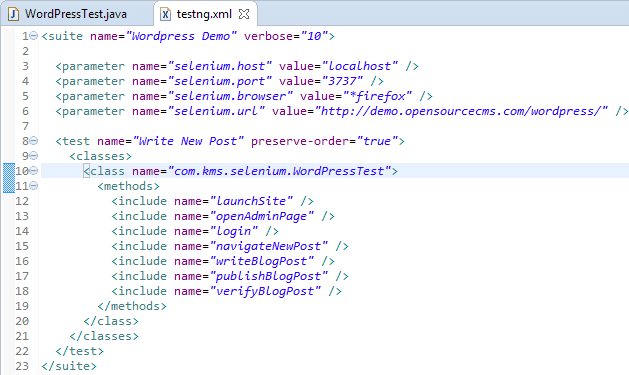 Although it uses several Selenium’s functionality, it is not simply a Selenium wrapper. This document offers a detailed comparison of Katalon and Selenium-based open-source frameworks, focusing on key features such as target users, deployment, test management and scripting language support, performance, usability, and integration with other tools. Katalon Studio’s users could be the testers with limited technical knowledge. Katalon Studio hides all technical complexities behind the scene and provides friendly UI with the manual mode (user can drag-drop, select keywords and test objects to form test steps), but still keeps necessary weapons for more technically powerful users who are able to dig deeper into coding with the scripting mode that fully supports development conveniences like syntax highlighting, code suggestion and debugging. Selenium and Appium are mainly automated testing libraries which are more suitable for testers who possess good programming skills. They will typically need to use an IDE like Eclipse or Visual Studio, to import Selenium & Appium libraries (and certainly their dependencies) into a development project, to install necessary unit testing frameworks like JUnit, NUnit and TestNG before starting to write a test case. Most open source projects are hard to setup and deploy because they are contributed by many different developers and providers who submit their work into a central place, i.e., Github. You may have to build everything using the submitted source code. 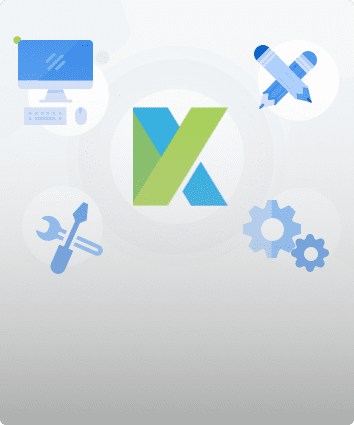 But even if frameworks are packaged into a ready-to-use stuff like Selenium and Appium, you still have to go through technical guidelines for their API and integrate them into with an IDE and a preferred programming language. Below are high-level steps required by Selenium, Appium and Katalon Studio to setup and run. 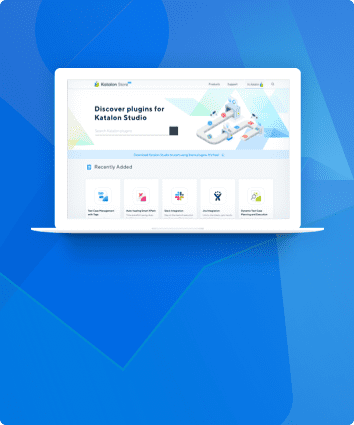 You can quickly get familiar with Katalon Studio as it has friendly UI and sample projects. The detailed user documentation (docs.katalon.com) definitely helps you go through quickly from simple to advanced features. Katalon Studio provides rich graphical UI with menus, tree views, tables, etc. 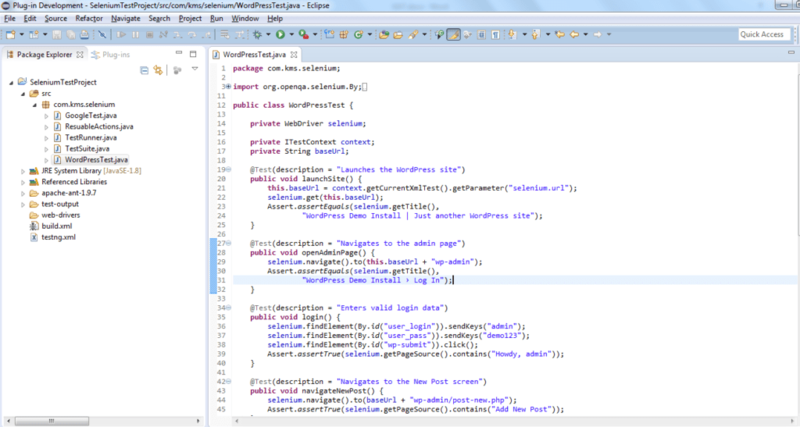 to manage test cases, objects and data files. 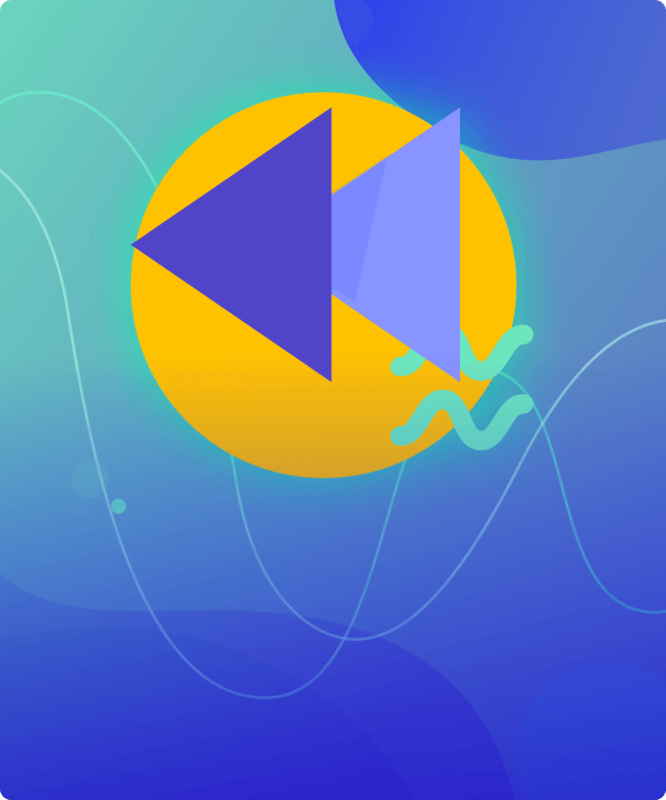 Its composer for scripting with full syntax highlight, code suggestion, debugging is ideal for testers who just want to drag-drop or have limited programming skills. 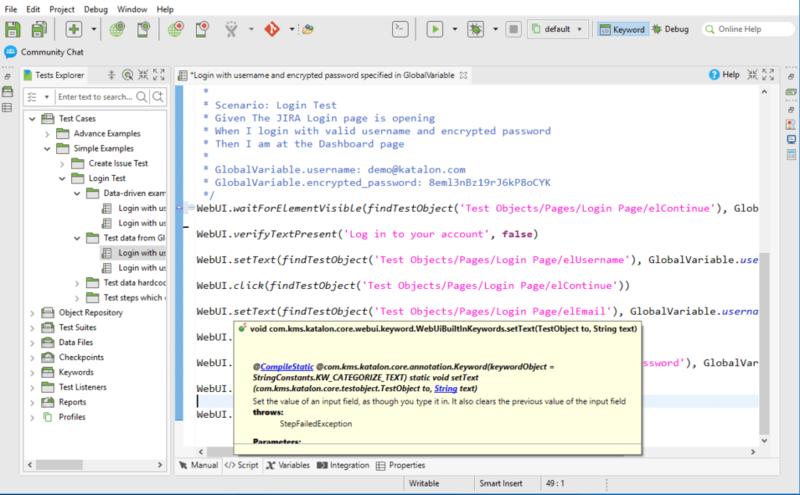 Katalon Studio uses Groovy, a language built on top of Java, and has to load many libraries for parsing test data, test objects, logging. So, it may be a bit slower as compared to Java for long test cases with hundreds of steps. 5.1 Object spy: Spying test objects is the most important but time-consuming activity in test automation. Appium provides a companion mobile object spy tool which is useful, but it has no high-lighting feature. Katalon Studio provides Data File object which can query data from external sources: CSV file, Excel file, Relational DB. Katalon Studio also supports data-driven testing on a data file object. For example, when testing the login feature, you can specify 100 pre-defined accounts in an Excel spreadsheet or a database. Test recording is the best way to help users learn and quickly adapt to test automation. 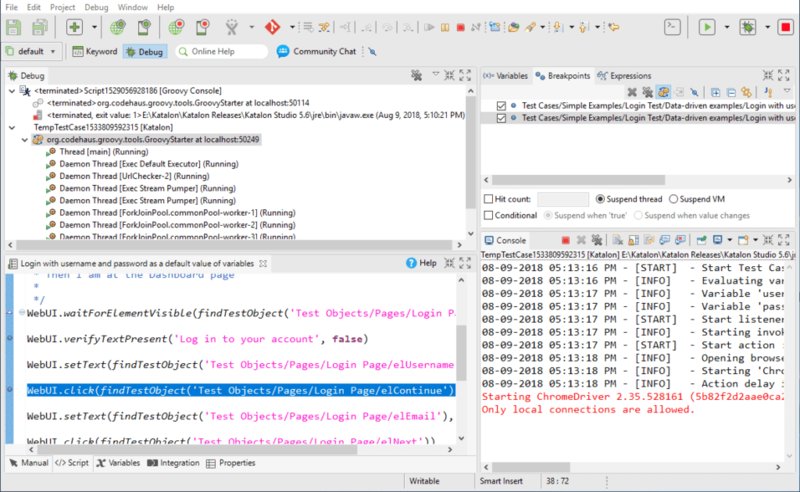 It helps an automation tester to do two primary jobs: capturing objects (during recording) and generating test steps with appropriate actions or keywords, saving at least 50-60% time of composing test cases. 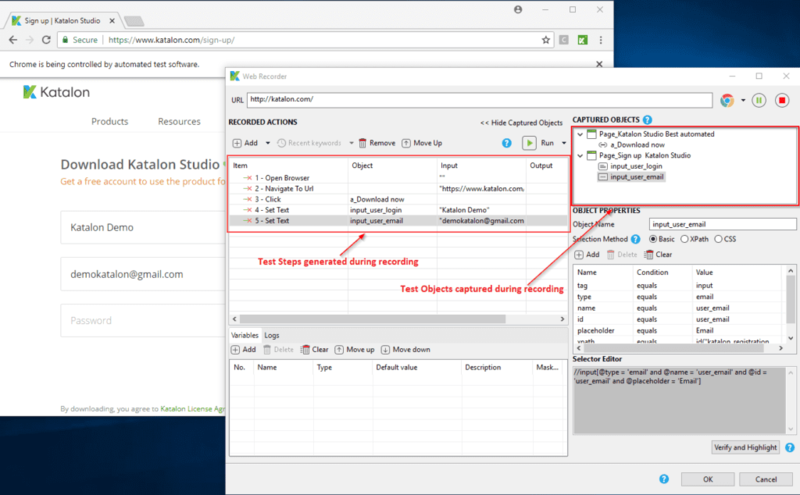 Similar to Katalon Studio, Appium supports recording and generating test scripts for mobile apps. Katalon Studio provides intuitive reports with friendly and readable messages and captured screenshots at the time of failure which can be exported into CSV, HTML and PDF files. 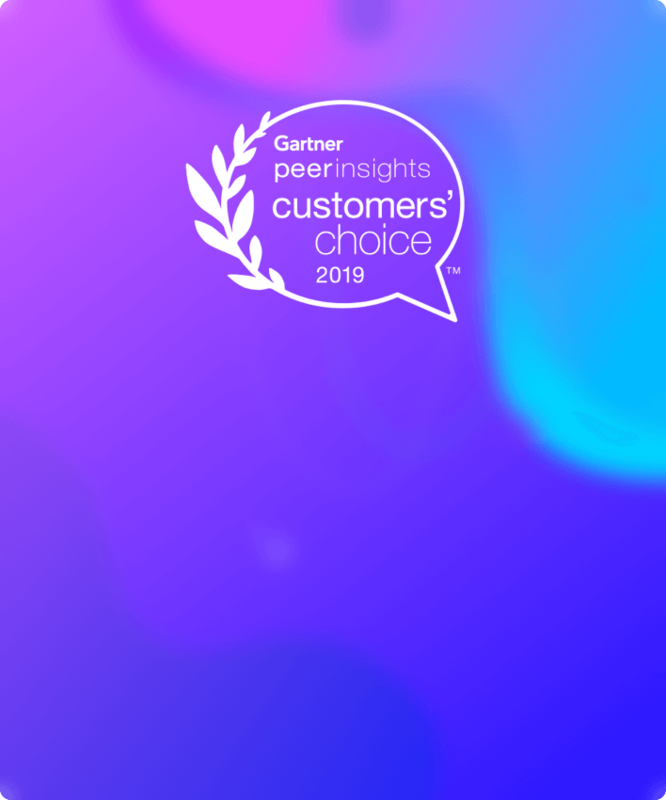 Katalon Analytics visualizes test execution results in an actionable fashion that enables teams to quickly diagnose and have better insights of their automation tests. 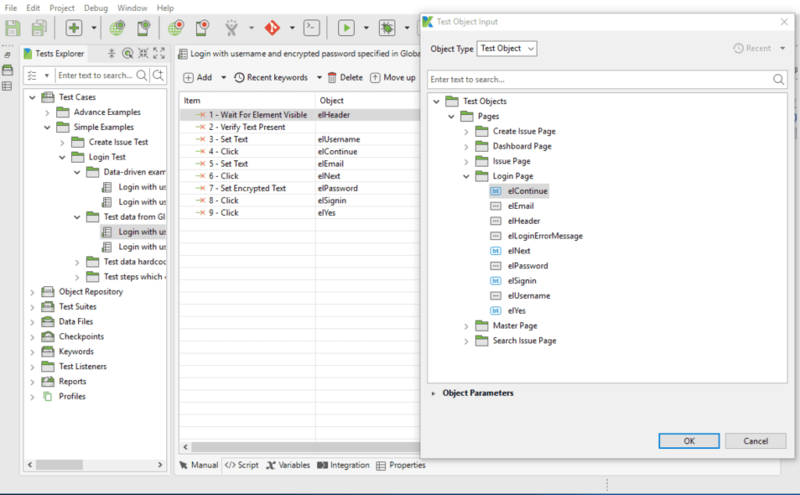 Selenium and Appium do not have reporting tools themselves, but based on the testing framework being used will have some simple report templates. 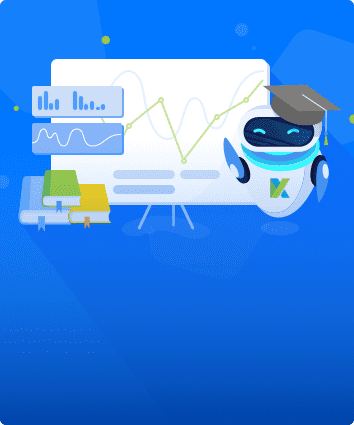 Sophisticated reporting and analytics capabilities like what Katalon offers are probably among the most wanted features for Selenium and Appium. 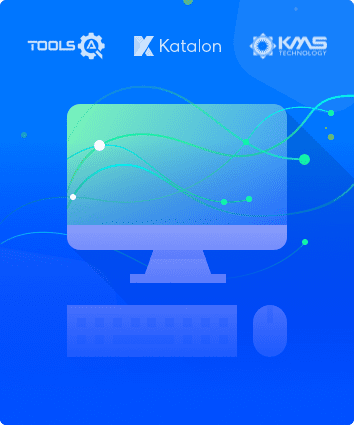 Katalon Studio can integrate with several test management systems and bug tracking systems including qTest (https://www.qasymphony.com) and JIRA to submit bugs, defects, test logs and test results. 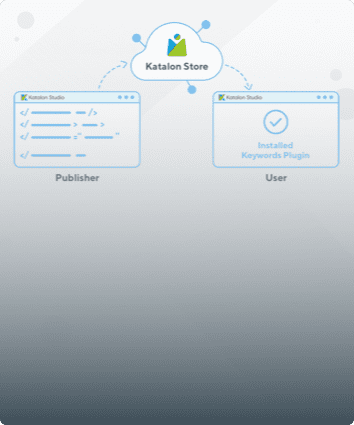 Katalon Studio can also integrate with Kobiton, a cloud-based mobile lab for cloud-based mobile testing (https://kobiton.com). 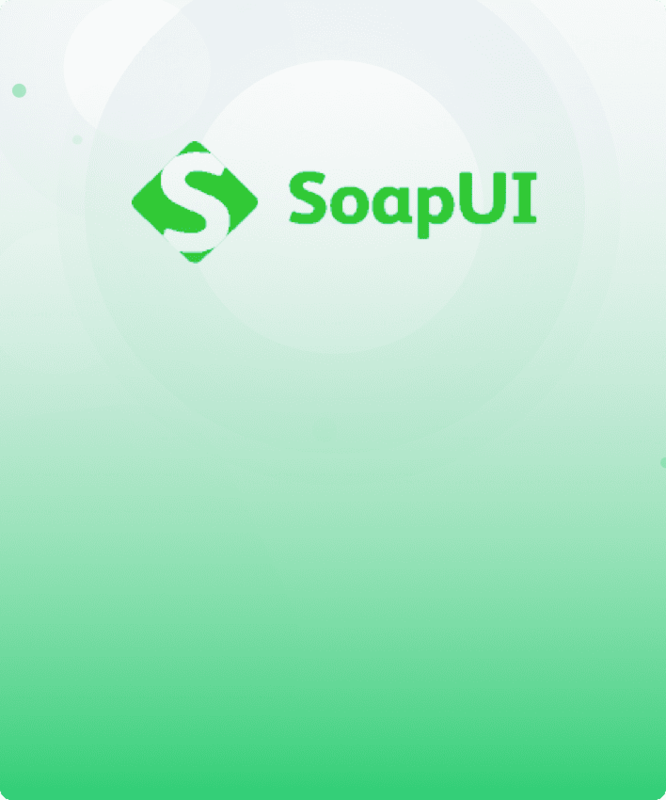 Selenium and Appium: no integration, users have to build the integration capabilities themselves. Selenium and Appium: users have to create and configure execution jobs (Ant tasks, maven goals, etc.) 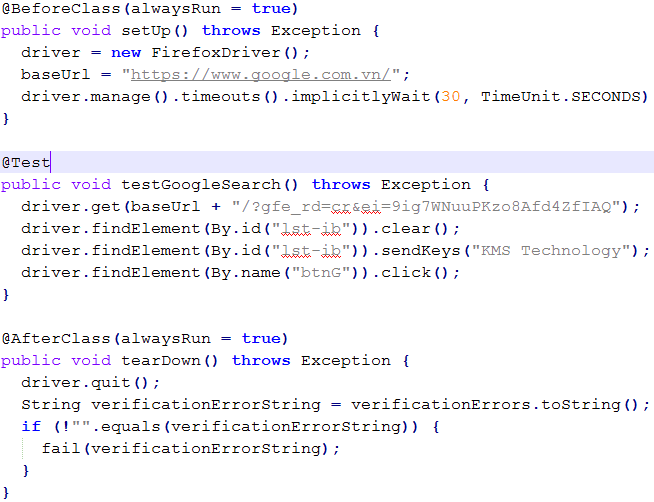 to trigger test execution. Selenium and Appium are open source, and users may find online help somewhere from other users or the Selenium group but nothing is guaranteed that they will get help quickly. The Selenium and Appium groups do not have a clear release plan, and bugs reported do not usually get fixed quickly. Katalon Studio is released monthly (minor releases for hot fixes are often available within a few days to a week), and bugs are usually fixed within days. User feedback is highly appreciated and resolved quickly. Selenium can only deal with HTML content inside a browser. Special and customized controls such as Windows popups and embedded objects (Flash, Flex, Media) will make Selenium fail to handle. Katalon Studio, on the other hand, provides capabilities to handle these Windows controls and recognize images. Katalon Studio allows starting test from any step with an already opened session which is very helpful for troubleshooting test. Katalon Studio overrides Firefox Driver to make new Firefox versions (47+) backward compatible with old Web Driver while the Selenium community is still struggling with the unstable Gecko driver.